Summary: Greenbrier built two batches of bogie box wagons for Network Rail in 2009. 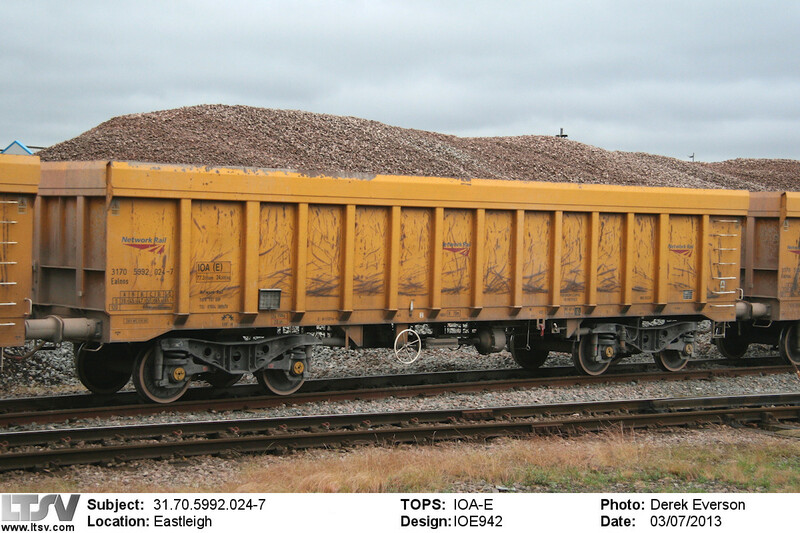 120 were high-sided wagons coded IOA and used in block formations to deliver ballast to virtual quarries. The other 40 were low-sided IEAs, assigned to general infrastructure work alongside similar wagons of types JNA and MLA. 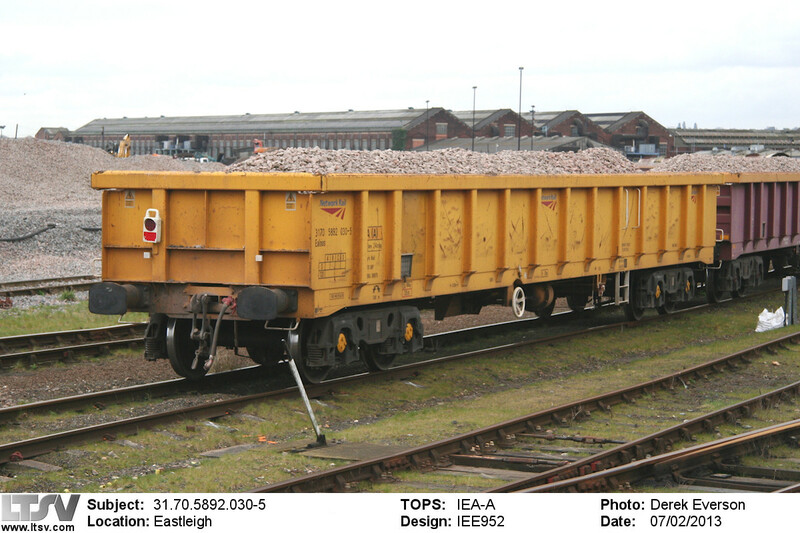 History: In January 2007 Network Rail issued invitations to tender for the supply of 175 bogie box wagons. These were planned to be split between 120 102-tonne wagons (similar in capacity to the green JNAs latterly leased by Railtrack) and 55 90-tonners (like the existing JNA and MLA fleets) . The contract was awarded to Greenbrier and a prototype of the larger design was delivered in September 2008, coded MJA to design code MJ004A. Mounted on Axiom Rail TF25 bogies, the wagon was similar to Freightliner's MJA twin box wagons but featured conventional couplings at each end and wore a livery of all-over yellow . The numbering of 502201 followed on from two other single MJAs used as bogie test beds (502199 and 502200) and was probably the last new number in the traditional series. Earlier in 2008 it had been decided that 'international' numbers would be used for all new wagons, following the issue of a Technical Specifications for Interoperability document by the European Railway Agency . 502201 did not enter service following its trials. It was deregistered from TOPS in December 2008 , although its subsequent fate is not known. The production wagons started to arrive in early February 2009 , and the deliveries were completed within a month . The wagons differed from the prototype in that they had a very deep capping strip around the top of the bodywork. Livery was black bogies (Axiom Rail TF25s) and buffers, everything else being yellow, and three Network Rail logos were applied on each side. International numbers 31.70.5992.001-120 were carried and the wagons were coded IOA-E to design IOE942 . The full TOPS code was shown on the wagons in the form 'IOA (E)', along with the UIC type code of Ealnos . IOA 31.70.5992.024-7 was seen at Eastleigh in July 2013, already looking quite well used. Note the very substantial top capping. The marks on the sides are caused by the diggers that are used for loading and unloading. Although it may look as if the wagon is distinctly overloaded, the ballast is actually a stockpile in the background. Delivery of the 90-tonne wagons followed in spring 2009 , the order having been reduced from 55 to 40. As well as being lower and longer (similar in size to an MLA), these wagons differed in having more normal top capping and being mounted on Axle Motion III bogies. Livery was the same yellow. Numbered as 31.70.5892.001-040, they initially carried TOPS code IOA-F and were assigned design code IOE952. Within a few months the codes were changed to distinguish these wagons from the 102-tonne versions. The TOPS code became IEA-A and the design code was changed to IEE952, although they still carried the same UIC type code of Ealnos . IEA 31.70.5892.030-5 was photographed in February 2013, also at Eastleigh. Note the similarities between this wagon and the MLA it is coupled to. The IOAs have been given the unofficial fishkind name of Mussel and are normally used in block formations, while the IEAs are now well mixed with similar wagons of types JNA and MLA. Links: Greenbrier webpage detailing the IEA and IOA. Includes a downloadable PDF with dimensions and diagrams.